Many Magnolia varieties and species are available for sale in Australia and they do have some of the most elegant flowers in the plant world. Magnolias trees come in both evergreen and deciduous varieties and small growing varieties are popular as specimen trees. Deciduous magnolia species are mostly from China, Japan and surrounding areas. Evergreen Magnolia varieties and species include new introductions such as Magnolia ‘Teddy Bear’ and Magnolia ‘Kay Parris’ as well as Magnolia Grandiflora. Magnolias prefer an open sunny position, mulch or leaf litter out to the drip line will help keep roots cool. Magnolias do not have a high fertiliser requirement once established. Before planting dig in well rotted manure and remember to water Magnolia regularly when establishing. Flowers in the first year can sometimes be a little disappointing, but this will improve by the third year. Magnolia macrophylla with its large fragrant white flowers with red inner band and leaves up to .5m is a fantastic specimen. Magnolia Little Gem is a very popular evergreen magnolia tree. Magnolia little gem is a dwarf form of Magnolia grandiflora, grows to approx. 4m by 2.5m and is great as a feature or even as a screening tree. Magnolia ‘Felix’, Magnolia ‘Black Tulip’ and Magnolia ‘Vulcan’ are three new release Magnolias from Jury Magnolias in New Zealand. 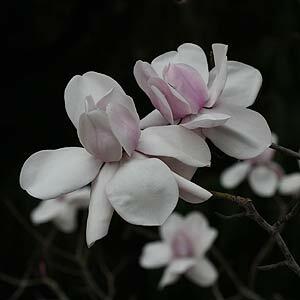 Magnolia ‘Felix’ produces stunning large flowers that have been measured to nearly 35 cm (14 inches) across. The fragrant flowers appear early in spring and Magnolia ‘Felix’ is a prolific flowering tree. Growing to around 5 – 7m (15 – 20ft) if left alone, expect Magnolia Felix to grow at 24 inches a year in ideal conditions but usually 12 inches. Foliage following the flowers is a lighter green than many magnolias but quite large. Magnolia ‘Black Tulip’ is another new introduction, dark red cup shaped flowers that maintains a tighter shape than many magnolias, they look a little like large rounded tulips, hence the name. Eventually this one will reach 4-6m (12 – 18ft) and again Magnolia ‘Black Tulip’ is a prolific flowering specimen. Magnolia Vulcan is another Jury release, a smaller growing tree to 5m (15ft) Large ‘port wine’ coloured flowers and again a prolific flowering deciduous magnolia well worth a place as a feature tree in the garden. Magnolia denudata, which is a white flowering species another is Magnolia sieboldii flowers in late spring through to summer with white flowers and stamens. Magnolia x ‘Lotus’ is another white flowering form as is Magnolia x ‘Milky Way’ and Magnolia ‘Pristine’ which is a cross between stellata x denudata.